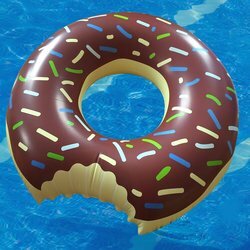 What is better than chowing down on some yummy junk foods by the pool? Here at ToySplash, we're going to help you get ready! We want to celebrate some delicious foods. 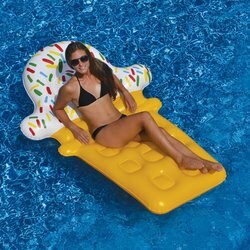 You can have a hot dog battle with this inflatable battle float! The soft inflatable, 12-gauge PVC is perfect for kids to play with and safe. You receive 2 hot dog floats, a ketchup bottle float and a mustard bottle float. Hot dogs are not only delicious anymore, they can be fun to battle on! Not to mention an easy to clean up food fight. Next up is this awesome Birthday Cake Ring Toss Game. Maybe your birthday is July 21st or maybe you just like cake! This game can be played different ways and with different amount of people, so make it your own! You can play in the pool, on the ground or even have the birthday girl/boy wear it on their head as a hat! 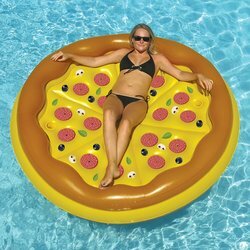 Or maybe mom and dad just want to relax on a huge inflatable pizza, ice cream or donut tube! We just want to help you celebrate days as exciting as junk food day!